First specs were written in 1933. -1x lightweight engine-mounted 20 mm MG FF cannon + 2x 7.92 mm MG 17s. The MG C/30 was an airborne adaption of the 2 cm FlaK 30 anti-aircraft gun, firing the very powerful "Long Solothurn" ammunition. But the gun was heavy and cumbersome and had a low rate of fire. For wings armaments, choices were limited as wing loading should be kept below 100 kg/m2. Tests would be level speed, rate of climb, and maneuverability. Design work on P.1034 began in March 1934 (3 weeks after the signed development contract). The basic mock-up was completed by May. A second, more detailed was shown by January 1935. The RLM designated it the "Bf 109," after the next available block of numbers (by BFW). The Versuchsflugzeug 1 completed by May 1935 had civilian registration D-IABI. But the new German engines were not yet ready therefore ironically the RLM acquired four Rolls-Royce Kestrel VI engines by trading Rolls-Royce a Heinkel He 70 Blitz for use as an engine test-bed! Messerschmitt received two of these, quickly adapted to the V1. Maiden flight occurred at the end of May 1935 south of Haunstetten, piloted by Hans-Dietrich "Bubi" Knoetzsch. After four months of testings, the aircraft was delivered in September 1935 to the Luftwaffe's central test centre at the Erprobungsstelle Rechlin, soon to be part of the design competition. The V2 was completed in October with the planned 449 kW (600 hp) Jumo 210A engine. The V3 followed, this time armed with guns, had to wait until May 1936 to receive another Jumo 210 engine. After Luftwaffe acceptance's trials has been completed at E-Stelle, the RLM's military aviation test and development facility at Rechlin, prototypes were sent to E-Stelle Baltic, on the seacoast facility at Travemünde for the manufacturers competition. The other contenders were the Arado Ar 80 V3, Focke-Wulf Fw 159 V3, Heinkel He 112 V4 and Bf 109 V2. The He 112 arrived as early as February 1936 followed by the others the end of the month. Because most fighter pilots were used to biplanes with open cockpits and low wing loading, light g-forces and easy handling, they were at first very critical of the Bf 109. But it emerged as one of the frontrunners in the contest. Indeed the Arado and Focke-Wulf, which intended as "backup" programs and were completely outclassed. The Arado Ar 80 indeed had gull wings (later straight on the V3), a fixed spatted undercarriage and the design was soon abandoned. The Fw 159 was a parasol, potentially inspired by the earlier Focke-Wulf Fw 56, and considered by the E-Stelle like a technical compromise. It used a brand new retractable main undercarriage which was unreliable. Bf 109 tests showed other shortcomings for the pilots like a steep ground angle (poor forward visibility when taxiing) a cockpit canopy that could not be opened in flight, trigger-happy automatic leading edge slats on the wings (later the design proved to be right). Also leading edge slats and ailerons would flutter rapidly in hard turns, possibly leading into a stall condition, and the high wing loading because of their relatively small size. The Heinkel He 112, was a scaled-down Blitz, a record plane and favorite by Luftwaffe leaders, included Goering. 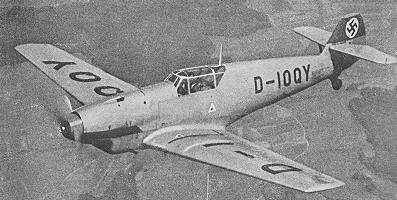 It was also cheaper than the Me 109, looked more gracious and less cramped. Moreover it had wide track and robust undercarriage opened outwards from mid wing. The Me109 at the contrary was famously plagued by inwards opening undercarriage that rendered landings and taxiing somewhat more hazardous. But the situation changed as the He 112 was structurally complicated, was 18% heavier than the Bf 109 and its thick wing, was a disadvantage for a fast fighter, as it makes it more stable and therefore decreased the aircraft's rate of roll and maneuverability. The He 112 V4 was therefore given new shorter wings. But improvements had not been fully tested and the V4 could not be demonstrated in time to the Acceptance Commission. As a smaller, lighter fighter, the Bf 109 was 30 km/h (20 mph) faster in level flight, superior in climbing and diving. The Commission therefore ultimately ruled in favour of the Bf 109, notably after a convincing display from Messerschmitt test pilot's in a series of spins, dives, flick rolls and tight turns. In March, the RLM wasinformed that the British Supermarine Spitfire had been ordered into production. Therefore a quick decision was needed to get the winning design into production asap. On March, 12 March, the RLM announced the results in the Bf 109 Priority Procurement, with a firm production order. At the same time, Heinkel was ordered to radically re-design the He 112, leaving hope for the company it can stay as a backup fighter. The Me 109 V1 made its public debut during the 1936 Berlin Olympics. But paradoxically, doubts were left as it was a new fighter or an acrobatic plane. In fact 54 B-0 and B-1 were to be built only, 17 included in the Legion Condor and later left to the Nationalist, 12 were given to the Japanese, 24 to Romania, wile a single one stayed in the Luftwaffe. The He 112 led to a completely revised He 100. Not loosing any hope, Heinkel came back with a completely revised design, somewhat influenced by the Me 109 as it was much smaller, had reduced straight wings, a more powerful engine, the DB-601 inverted V12 (1175 hp), and a simplifed airframe. It was way faster also, reaching 670 kph on flight trials. The prototype flew on January, 22, 1938, already taking the world record at 638 kph with Udet. In March 1939, the V3 would reached a whooping 746 kph with Hans Dieterle. But the RLM don't see the necessity of a second fighter and the development is topped. Six prototypes V1 to V8 would be sent to USSR, three to Japan while the 12 He-100D-1 were included in the Heinkel own's defense unit at Rostock. They were abundantly filmed, and photographed to participate in a deception plan, making the allies believe it was the main Luftawffe's fighter by German Propaganda.